The legendary four-piece ensemble The Jan, based in Halden, Norway, specialized in cover versions of songs by The Band. Actually, they only played "The Weight" (rumors say they tried playing "Up on Cripple Creek" once, but failed miserably) and the odd blues number every now and then. 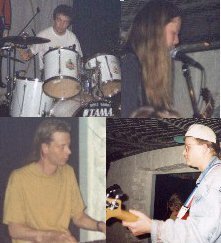 Formed in the spring of 1996 they have rehearsed for a total of two and a half hours and played numerous times at the infamous R.Ø.L.P. festival in Halden.